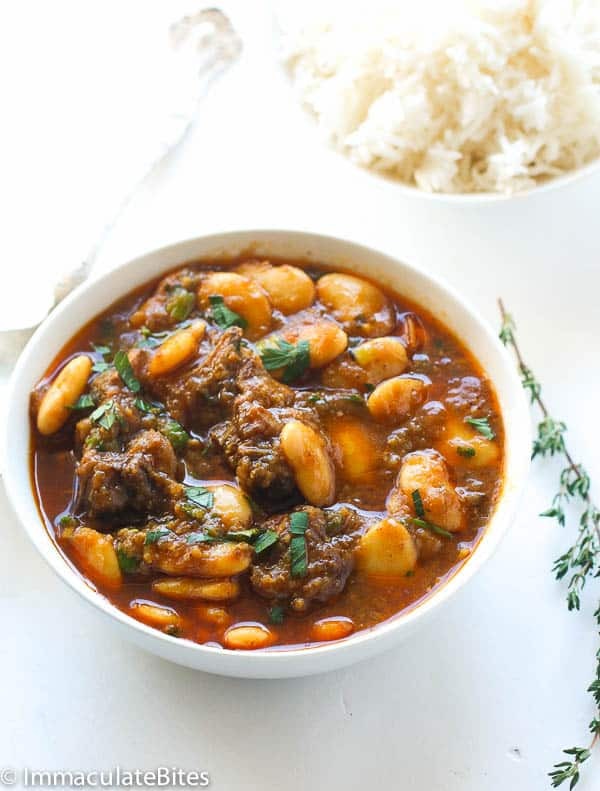 Jamaican Oxtail Stew – This braised oxtail with butter beans not only have a complex note from allspice but also that familiar garlic, thyme, scotch bonnet and onion medley. Fall of the bone tender. 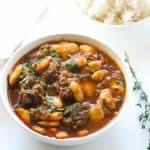 If there is one Jamaican dish that is real popular and a favorite of many, is this Jamaican Oxtail Stew with broad beans. It is truly loved by many, myself included. As a matter of fact, it has gotten me in trouble plenty of times. I use to work not too far from a Jamaican restaurant and would order it 3-4 times a week. Lets just say, ordering it more often is not a wise decision for my wallet nor my waistline. But I can certainly tell you my belly was pretty happy. I know, here in the U.S. oxtails don’t get that much love compared to other cuts of meat but it should. And you should put it on your food bucket list and try it at least once. Furthermore, it’s tail-end delicious, finger licking good. AND you are going to want to nibble on the bone and beat yourself for not trying it out sooner. Yes, talk about soul satisfying!! This one is out of this world, just INCREDIBLE! 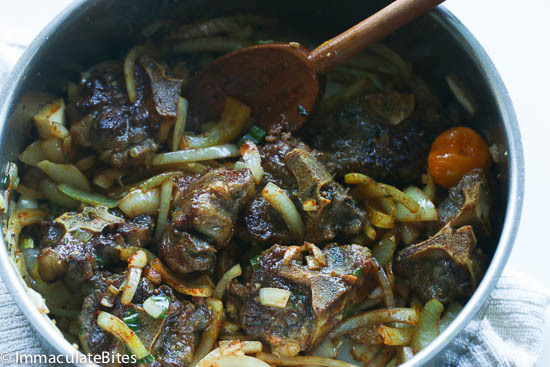 Now lets delve more into oxtails. Oxtails are great for braising and require a long cooking time — usually about 2-3 hours. Slow cooking breaks down the connective tissue and renders it tender, fall off the bone. Which is what I recommend, especially for first timers. Unless you are like me, I like it with some bite to it and love to suckle and nibble the bones – a cultural thing. Additionally, if you can have the butcher cut the oxtail into medium pieces, that’d be good . It helps cut down on the cooking time. Oh, make sure you pick out the ones with less visible fat. 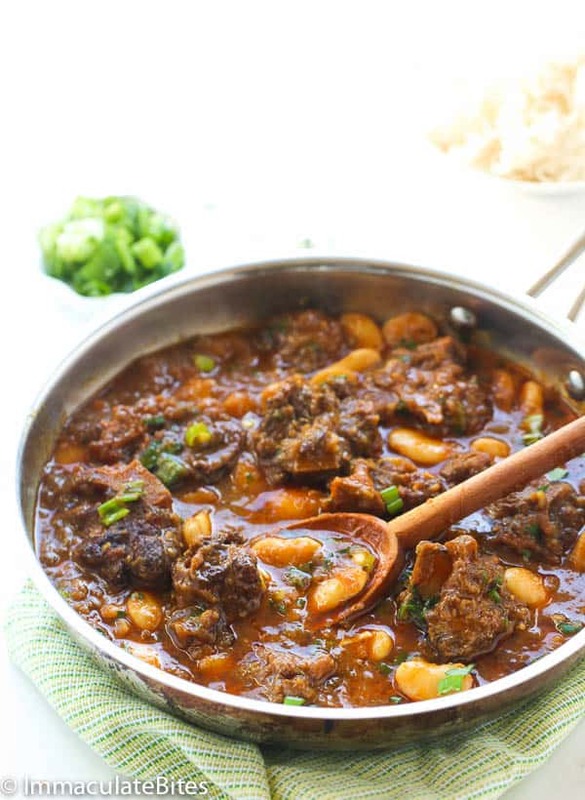 Jamaican oxtail stew is usually made with broad beans. 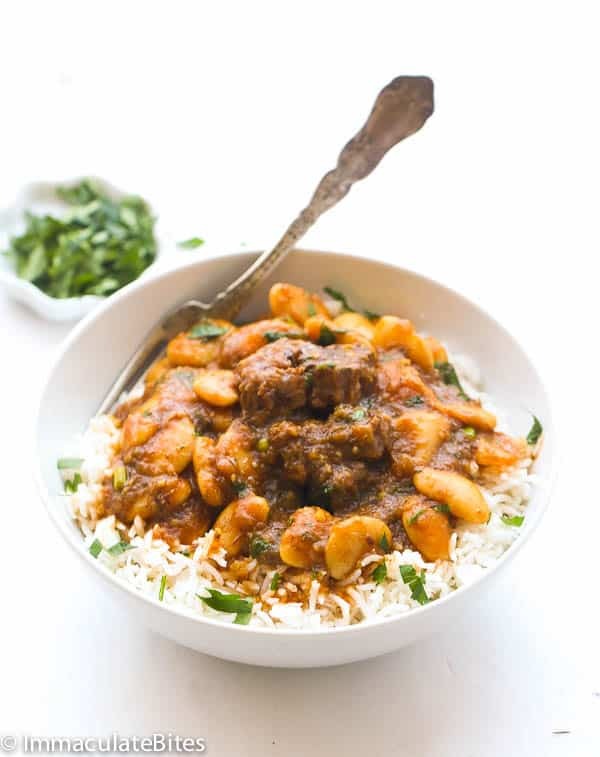 If broad beans are not available, use lima beans or use large white beans. Serve this coconut rice or rice and beans. If you want a really dark color like the ones you would sometimes see at a Jamaican restaurant then go ahead and use browning sauce. I did not include it here. 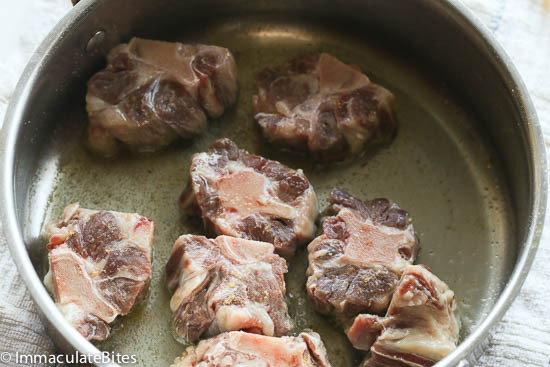 If you have particularly fatty oxtail be sure to spoon out the thin layer of fatty oil,about 1 hour into boiling. Not traditional but sometimes a necessary especially with non- organic cows. Enjoy!!!! 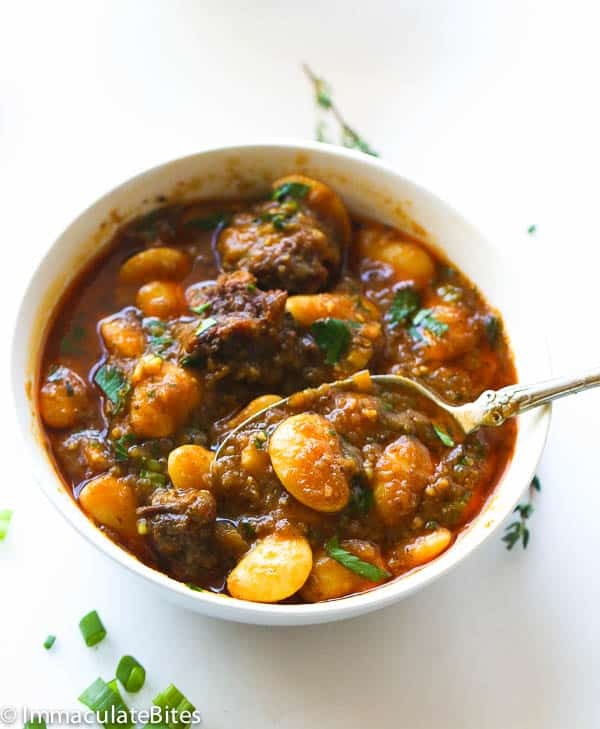 Jamaican Oxtail Stew- This braised oxtail with butter beans not only have a complex note from allspice but also that familiar garlic, thyme, scotch bonnet and onion medley. Fall of the bone tender. Add onions, green onions, garlic, thyme, all spice, worcestershire,smoked paprika, stir for about a minute. Throw in scotch bonnet pepper, tomato paste, bouillon and curry powder, stir for another minute. Then add about 4-6 cups of water , it's best to start with 4 cups , then add as needed . Bring to a boil and let it simmer until tender (depending on the oxtail size and preference) about 2- 3 hours, occasionally stirring the saucepan. Season with salt according to preference. Cut your oxtail in medium pieces and trim excess fat. 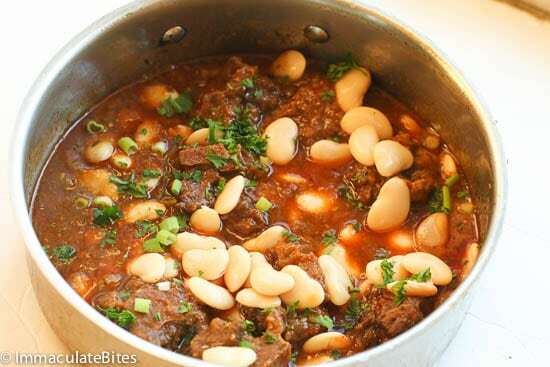 Season with salt and pepper and saute for about 3-5 minutes on both sides In a large pot, heat oil over medium heat, until hot, and then add the oxtail sauté stirring, frequently, any browned bits off the bottom of the pot, until oxtail is brown. 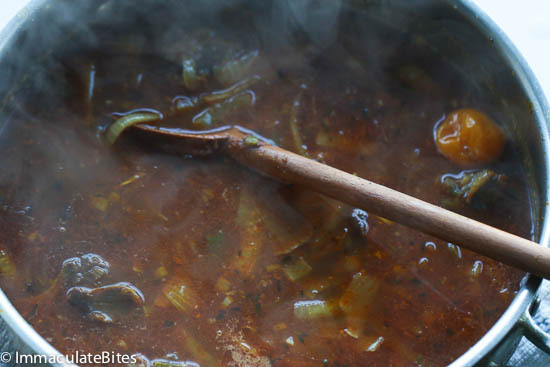 If desire drain oil and leave about 2-3 tablespoons Add onions, green onions, garlic, thyme, all spice, worcestershire, smoked paprika, stir for about a minute. Throw in scotch bonnet pepper, tomato paste, bouillon and curry powder, stir for another minute. Make sure garlic doesn’t burn Then add about 4- 6 cups of water, it’s best to start with 4 cups , then add as needed . Bring to a boil and let it simmer until tender (depending on the oxtail size and preference) about 2- 3 hours, occasionally stirring the saucepan. Season with salt according to preference. About 20-30 minutes before you remove from the stove add broad beans. 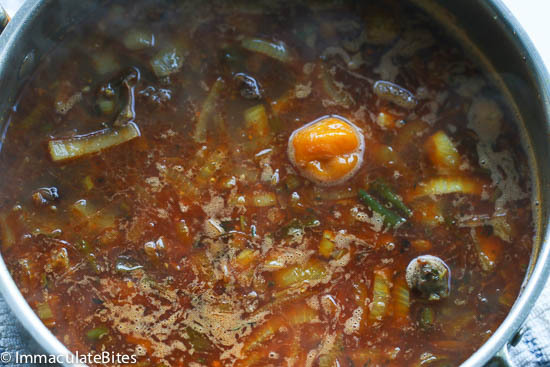 Adjust thickness of soup with water or stock Adjust thickness of soup with water or stock and seasonings. Throw in some parsley if desired (about 1 tablespoon or more). and it was even better this time Leftovers tomorrow. YUM! Just made this and the whole family were begging for more. 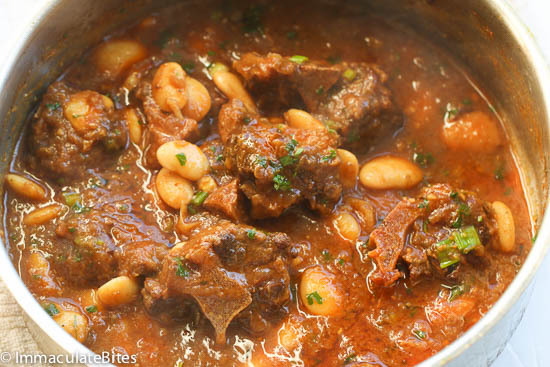 I want to make your Jamaican Ox Tail Stew. I only have ground Allspice how much would I use for this delightful dish? I love all the dishes I have tried from your site. 6 allspice berries grinds to about a teaspoon’s worth, depending on their size. I’ve made this recipe twice now and it’s very tasty indeed. I cooked it it march 2019 and it wad great I loved it not just myself but others who I shared it with, thanks for your recipe and I am about to cook some right this minute..
Hi! Love all of your recipes! Should I double all of the ingredients for double the amount of oxtails? Made this for the first time and it is exactly as I remember it from growing up in Toronto and many Jamaican restaurants! Thanks for sharing! I decided to make Oxtail Stew for the first time, Googled, and I found your site again! I will be using your recipe for reference when I make mine. Just so I understand, when you say “1 Whole Scotch bonnet pepper” you mean to leave it whole (I can see where chopping it up would overpower the rest of the ingredients). Yes, leave it whole, do NOT chop it up. Scotch Bonnets are very HOT. I’m Jamaican so I know. Are you married? ?because anyone that has this recipe in there aresenol can cook. Has anyone cooked them using a crockpot? Yes! I definitely like browning my oxtails before I place into the crockpot. Made this for the first time and struggled to find what I thought would be an authentic Caribbean recipe. Thought I would give it a try. Absolutely delightful!!! The dish reminds me of my grandma 100%. I sautéd and pressure cooked in my instant pot for 25 mins and finished on the stove which worked perfectly!! This is my new go to recipe and my husband and 2 girls also devoured it. My first time making oxtails and they were off the CHAIN!!! Thank you Imma, You are the BESt!!! Tried this recipe for the first time tonight. Used the prescribed amount of ingredients and started with 4 cups of water. Although the flavours are there which are excellent I found the recipe to be too soupy. Awesome! Made previously, but not in a while. Used canned Lima beans at the end. Put a cup of burgundy vino rinsing a bottle of Heinz Ketchup in as well as more curry (you can’t even taste it) and Tobasco sauce (10 “hits”) lol Also celery, carrots and small red potatoes, one extra onion! Thank you for being my guide this time! This is one of my favorite dishes and I can’t wait to try this recipe this weekend! Would it be too much to alter the recipe a bit and add potatoes and carrots? Feel free to add extra veggies. Enjoy! I believe you saved my marriage with this recipe! Tried it for the first time and then again a few days ago. Needless to say it was a complete success and loved by my family! Thank you ever so much!